Over 1200 pages long, the report delivers a clear strategic advantage, such is the scope and breadth of content. 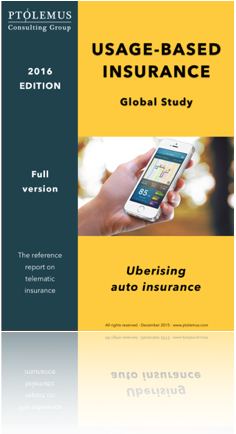 PTOLEMUS has created the UBI Global Study as a reference guide for all insurance players, irrespective of how accomplished they might be in telematics insurance. The 2013 study was already the most comprehensive piece of research on the subject and was acquired by more than 70 companies worldwide. With this new edition, we went far beyond updating. 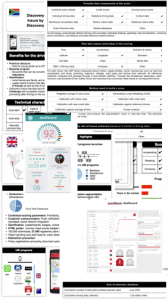 We produced the most current strategic and competitive tool for the insurance and the telematics sector. We set out to update the 2013 analysis and look at the most common questions asked during our interviews. Then we set out to answer them precisely, honestly and from all angles. What are the ways Google could disrupt the auto insurance market? How will UBI evolve over the next 5 years? What will be the impact of smartphone apps on UBI? 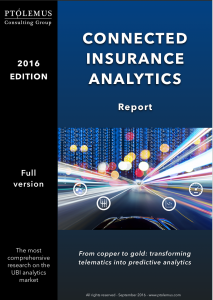 How will the evolution of analytics affect underwriters and actuaries? How and when will ADAS affect the insurance sector? How is telematics data being used in claims today and will this change? What are the implications of mandatory eCall in Europe and when will it have an impact outside Europe? What are the current smartphone-based UBI initiatives and business models? Which are the main channels to market for OBD data related services? How will the device mix evolve? Will the relationship between insurers and OEMs change? How should insurers expect their relationship with OEMs to evolve? Is UBI making cars more vulnerable/susceptible to hacking? The parameters that are most widely used to score driving behaviour and the ones that really should be. There are changes afoot which other forecasts cannot show. The UBI Global Study Forecast has been extended to 2030 to encompass the effect of emerging autonomous safety functions and, ultimately, semi and fully autonomous cars. The Excel forecast is over 2400 lines deep and is based on our 6000 line bottom up model using more than 2500 lines of input. The forecast was last updated in January 2016 with the latest available market figures derived from interviews and secondary research. By geographies: 16 areas, including USA, Canada, France, Germany, Italy, UK, Japan, China, India, Brazil, South Africa, Russia and LATAM. By technologies: including line-fitted OBUs, professionally installed and self installed black boxes, light OBD dongles, connected OBD dongles, windscreen devices, Cigarette Lighter Adaptators and smartphones. Number of vehicles in use with autonomous functions and associated penetration. Motor insurance and UBI market size in terms of volume and value for private insured vehicles. Breakdown of volumes by technology and channel. Breakdown of revenues along the value chain. Motor insurance and UBI market size in terms of volume and value for fleet vehicles (fleet passenger cars, light commercial vehicles, heavy commercial vehicles). Motor insurance and UBI total market size in terms of volume and value for all insured vehicles. 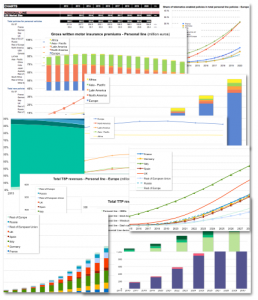 Breakdown of revenues along the value chain (TSPs, TTPs, MNOs). The study describes how to leverage telematics with analytics. Which data to collect and what factors to rate. It discusses why contextual information is required and how to use it. It also analyses in detail the supply offered today through 10 analytics company profiles. The study details the present and forthcoming autonomous functions affecting the insurance business. It analyses the speed of the technical evolution and the predicted timing of the autonomous functions’ emergence. The study then analyses and forecasts how and when autonomous safety functions will affect the insurance industry and how this will affect the UBI market. The study analyses the internal and external forces affecting the claims management sector today, including car sharing and autonomous vehicles. It looks through case studies of successful implementations and highlights best in class usage of data in claims today. The potential benefits of big data to the claims management industry in the context of UBI are then assessed. Recommendations are then made to entice the claims management departments to consider telematics. The study offers a detailed assessment of the current mobile UBI initiatives worldwide as well as their solution providers. Find out the current range of business models on the market and how successful they have been. Definitive answers concerning mobile solutions capabilities and the remaining technical barriers. An answer to whether smartphone data collection is robust enough for UBI. See how future technological advances will impact the smartphone UBI proposition. Finally, based on our competitive analysis of the mobile UBI market, learn the key steps to launch a smartphone UBI programme. The study gives an incomparable overview of the technology and capabilities of the OBD dongle, from the data available from the port through to application. This is done through technical analysis of the OBD and through cases studies organised by vertical markets. You will find out what data can be accessed by insurers, which telematics services can be delivered / improved thanks to OBD data and what the major technical and safety risks are related to the use of vehicle OBD technology. 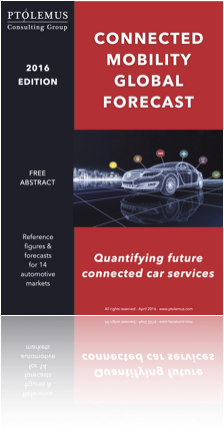 Finally, the study provides an analysis of the main channels to market for OBD data related services, as well as assessment of the key independent connected car service providers. The report analyses through case studies and interviews the current position of the OEMs on telematics services and UBI. It explains when insurers will be able to start using OEM data and what the likely models will be for insurance – OEM partnerships. From an OEM perspective, the report also gives recommendations on the best strategies to distribute the data and analyses the key constraints for OEMs to open vehicle data access. Finally, the study explains how Google and Apple will affect the OEM UBI data market, the home insurance market and health insurance market. “Danlaw serves many insurers in North America; yet, to continue our growth, we need to penetrate other markets. As a 300 person engineering company with scant marketing resources, we rely heavily on external research. The Global Insurance Telematics Study provides the most comprehensive analysis of the trends, players, devices, and potential. Mike Carroll, VP Sales, Telematics, Danlaw, Inc.